Spoorloos (a.k.a. The Vanishing) is a cult classic from Holland. This mystery thriller is an absolute cliff-hanger. And… there is no chance you can guess the outcome. How often do you hear that! Spoorloos is an outstanding thriller. If you like thrillers, this is one of the best. Whatever you do, do not watch the American 1990 remake. Even though it is by the same director, it is very poor and has a ridiculous re-imagined ending. You can find more information on this Dutch/French-language movie on Wikipedia and IMDb. Like we always recommend: don’t ruin surprises by reading spoilers or watching trailers. Oh, that is a good one! And you’re right about the Americanized remake. Skip that one. Our Dutch teacher always told us about the book and we also watched the film during class, a good movie indeed! Cool to see you posting about this Dutch classic. Mooie film, nederlands gesproken.And now in English: very nice movie, with some Belgian actors.Greetings from Belgium.By the way:very good blog. Long time since I saw that movie, but remember it well: indeed I never foresaw the end! O, die film heb ik ook gezien! Toen ik in de vierde zat was het bekijken van de film en er een toets over maken, onderdeel van het examen. Wat een nare film was dat! How interesting that two people with good taste can have such different opinions! Yours is radically different to mine. You wrote, “[Film is] …a piece of art which reflects an opinion and an attitude about life itself”. I think Spoorloos does that. The film is about love, loss, bewilderment and the need to reach understanding and find closure. And it is a piece of art. Anything created by an artist is art, whether you find it aesthetically pleasing or not. I think it is a brilliant film. So haunting. Frightening also because we all know there really are such bad people out there. Perhaps that’s one of the things you don’t like? Do you find it yet another unnecessary reminder of the evils in this world? Many thanks for sharing your thoughts! a. Glad to see that we are on the same page about what a film is. My intuition tells me that what author/director showed in the film is indeed their distilled opinion about life itself. This is what I do not like. c. You wrote “Frightening also because we all know there really are such bad people out there. Perhaps that’s one of the things you don’t like? Do you find it yet another unnecessary reminder of the evils in this world?”. It is not about fear. It is about stating my beliefs: https://10000movies.wordpress.com/judging-a-film/ . I think the major difference between you and I is what we wish to accomplish through the experience of watching a film. That’s why, for example, we can share the magic of Little Big Man (1970) but not Spoorloos. Film to me is a medium which should evoke as many different emotions as possible. I am looking for strong responses. Whether they be wonder, happiness, loathing or disgust, for example, is of no concern. Life-asserting messages are important and good for the soul, but I can also enjoy a well-made film which evokes utter despair. I don’t think watching extremely negative content has ever affected my person in a long-term capacity. I can enjoy a violent film – even simply for the sake of its gratuitous savagery – but it doesn’t stop me being a kind and sensitive human being. 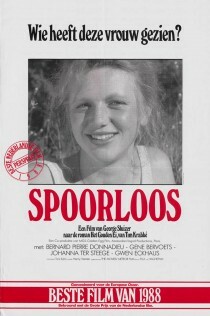 Spoorloos, in my opinion, is an exceedingly well-written and well-acted film. On the one-side, you can argue that the film’s message is that one should not bother fighting for what one believes in because it is totally hopeless – evil will win. One the side, you can argue that the message is that we should be willing to die for what we strongly believe in. Or, perhaps, there is no message. Perhaps this is simply entertainment; entertainment of a kind some people like and others don’t. And that’s fine. What I think is not good is to argue that something is not art simply because one doesn’t like it. Horses for courses, and all that. I believe the simple act of creation makes someone an artist, even if the rest of the world thinks it’s crap. There are certain types of music I cannot stand to hear but that does not mean the musicians and composers involved are not artists. It’s the same for film and all other forms of creativity. We take what we want from sources and leave the rest. That is one wonderful thing about this world: we have so many choices. A fact which I know you also celebrate. This is a very interesting conversation between the two of us. Please add more, if you wish. And we should invite others to share their opinions too! There is also the Jeff Bridges version which I saw years ago and found very haunting. It gave me nightmares. I am not sure I want to watch another version, but it was a damn good story! Saw this in Melbourne on its original release, which was probably 1989 for us. The movie ended and everyone was stunned – huh? You can’t end a movie that way! Just watched this, on the basis of your post, and really enjoyed it – thank you! I’m too scared to watch this one. I have been putting it off for so long because the dutch are really twisted..
Great stuff Shimky, few blogs feature your excellent selections. I love this one, Pete. So creepy.